Black Forest Cake is life. It’s got to be one of my favourite desserts, ever. Back in the day, I used to make a Black Forest Entremet that consisted of a Chocolate Biscuit, Milk Chocolate Mousse, Dark Chocolate Mousse and Griottine Cherries. Fast forward to my cruelty free life now, and Entremets are somewhat a thing of the past. 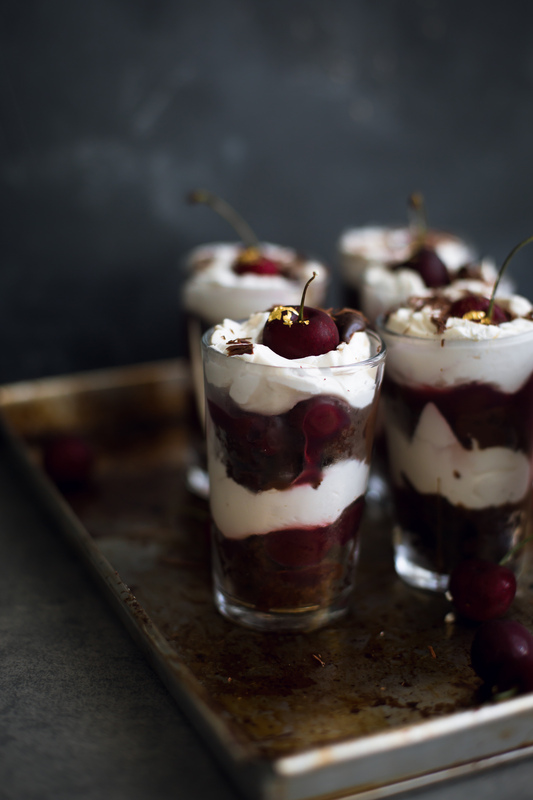 However, Black Forest Cake doesn’t have to be a thing of the past, and this Vegan Black Forest Cake Trifle is here to prove that. Icing whole cakes is not my favourite thing to do, even after graduating from Culinary School, so I have taken my Vegan Black Forest Cake recipe and turned it into a Vegan Black Forest Cake Trifle. Trifle is amazing, Trifle saves time, Trifle is perfect for lazy little shits like myself. Onto the recipe – we start off with a moist (love that word!!!) Chocolate Sheet Cake recipe which you’ll bake up and cool before assembling your Black Forest Cake. It’s so simple to make with basic ingredients – Flour, Oil, Cocoa Powder, Vanilla, Sugar, Soy Milk, Baking Powder and Baking Soda. No Black Forest is complete without a little Alcohol, so you’ll also be making a Kirsch Soaking Syrup that we’ll use to moisten the pieces of Chocolate Cake when assembling! Now, the star ingredient – the Cherries. For this recipe, I cook some Jarred Morello Cherries up with some of its own Juice, Sugar and Cornstarch to make a sweet and delicious Cherry Filling that is perfect in this recipe. Lastly, a Chocolate Ganache which is composed of 70% Dark Chocolate and Non-Dairy Cream (Rice/Soy/Milk). I want to talk a little about the Cream component of this Vegan Black Forest Cake. 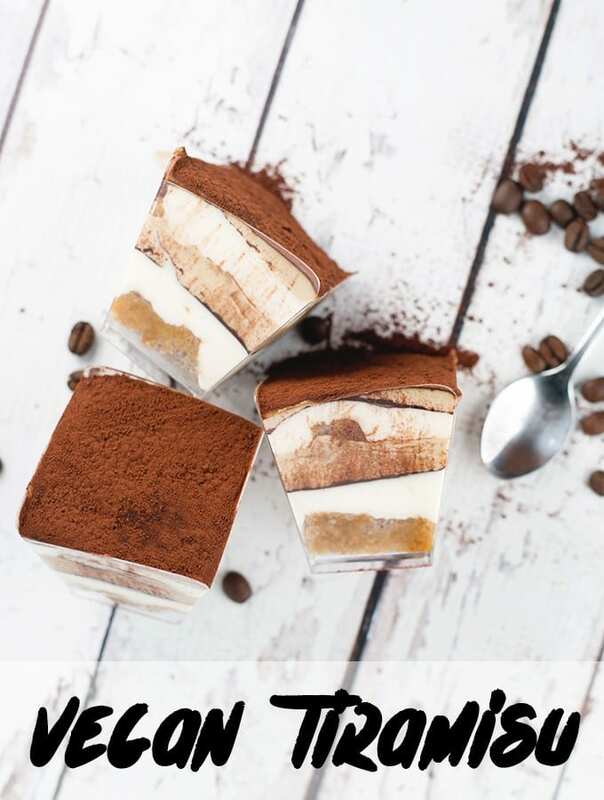 I have used Rich’s Whipped Topping for this recipe, but if you can get your hands on that, or even Soya Too Whipped Topping, then you’re good as gold. If you’re in the States or the UK, look for any non-dairy Whipping Cream or Whipped Topping you can get your hands on. 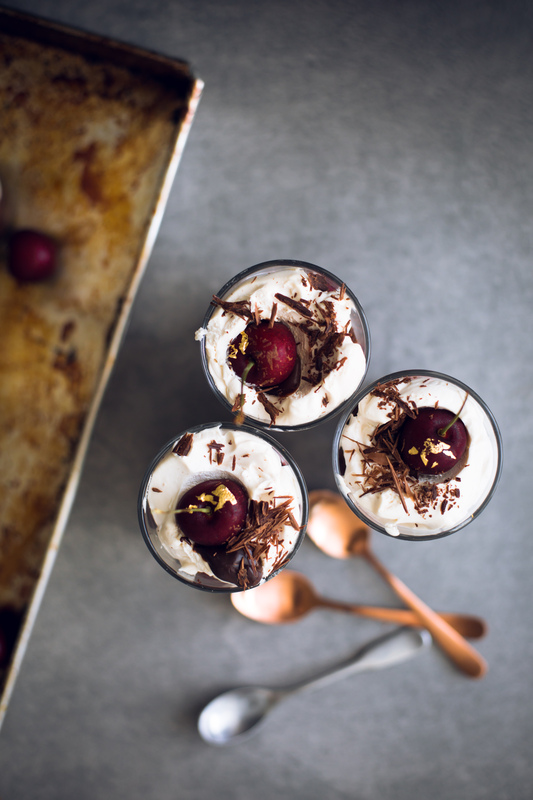 If all else fails, go with a Coconut Whipped Cream recipe which would be the last option because ideally, we don’t want our Black Forest Cake Trifle to taste too fatty or of over Coconutty! Whatever the case, there are many options when it comes to the Whipped Cream in this recipe, so use whichever suits you best. Once you have all your components ready, it’s just a matter of assembling everything together. Soaked Cake, Kirsch Syrup, Chocolate Ganache, Cherry Filling, Cream and repeat. 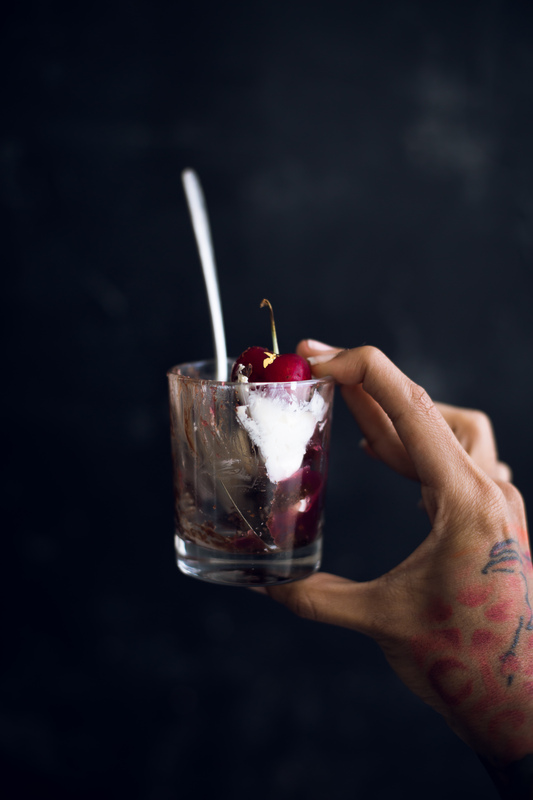 Once you’ve got all your layers done, sprinkle a little Shaved Chocolate over the top and garnish with a fresh Cherry that you’ll want to pop real bad. This is the ideal dessert for any Christmas gathering because it travels so well, and can be made a day or two in advance. 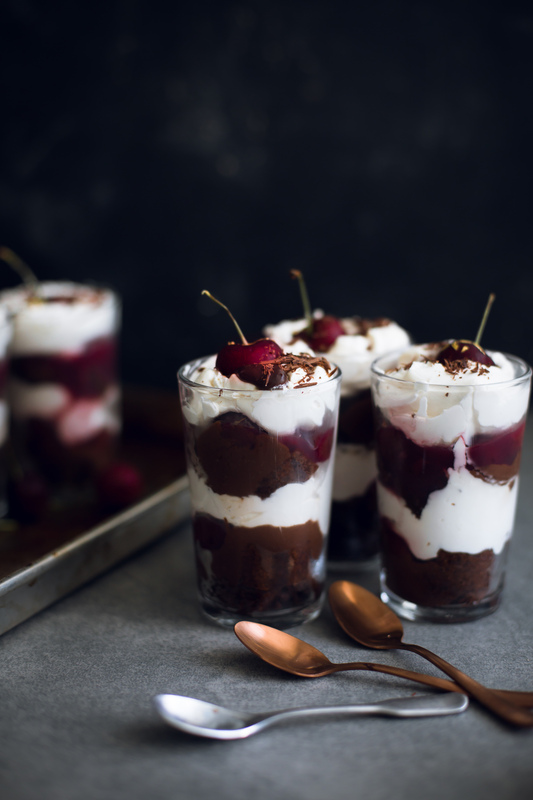 Scroll down to grab the full recipe for this Vegan Black Forest Trifle and get ready to make love to some delicious cake tonight. 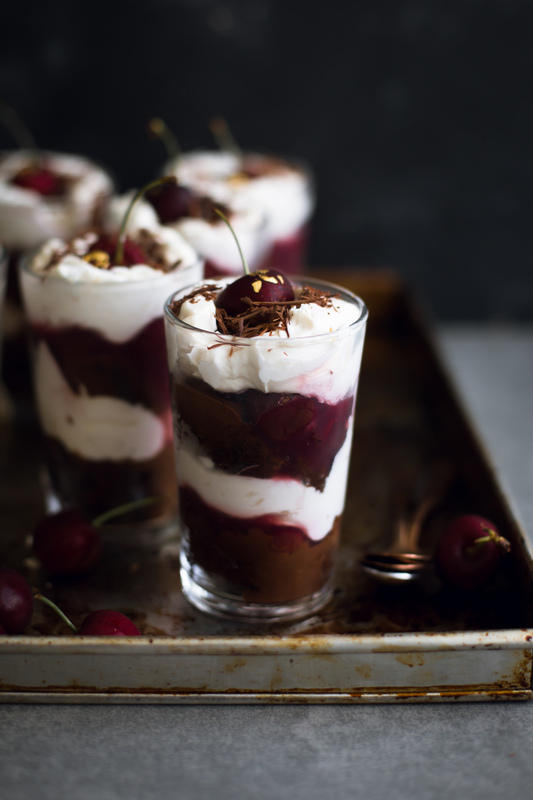 A delicious Vegan Black Forest Cake Trifle. Chocolate Sponge, Kirsch Soaking Syrup, Cherry Filling and Whipped Cream. Preheat oven to 180 degrees Celsius. Whisk Soy Milk and Vinegar together and set aside for 10 minutes to curdle. In a big bowl, combine Sugar, Oil, Soy Milk, Salt and Instant Espresso. Whisk to combine. Sieve in Flour, Baking Powder, Baking Soda and Cocoa Powder. Whisk till smooth. 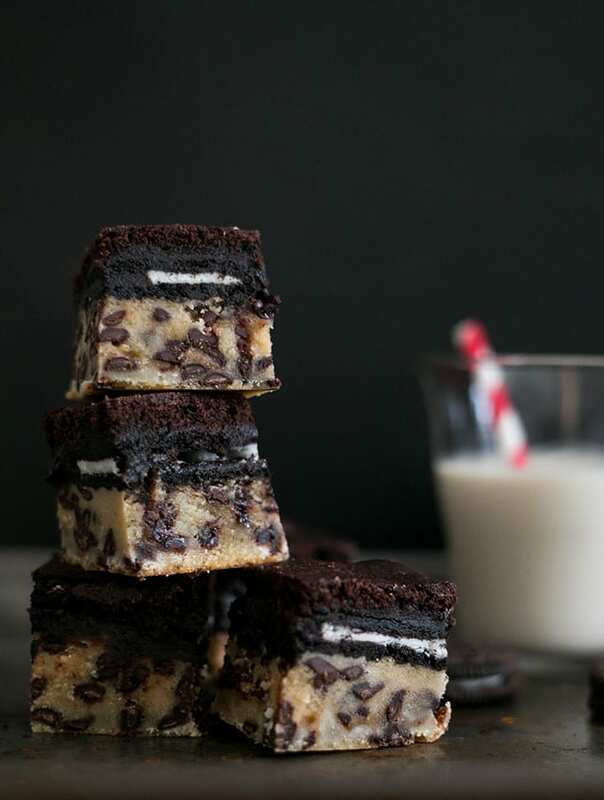 Line a 10 x 14 inch sheet pan with Non-Stick Baking Paper and pour batter onto pan. Bake for 12-15 minutes or until a skewer inserted into the middle of the cake comes out clean. To prepare Soaking Syrup, combine Sugar and Water in a pot. Boil till sugar is dissolved and continue to boil for a minute or two until slightly thickened. Pour syrup into a bowl and whisk in Kirsch. Set aside to cool. Meanwhile, prepare Cherry Filling. Halve your cherries and combine In a pot with Cherry Juice, Sugar and Cornstarch. Cook over low heat, whilst always stirring, until thickened and glossy. Pour into a bowl to cool. 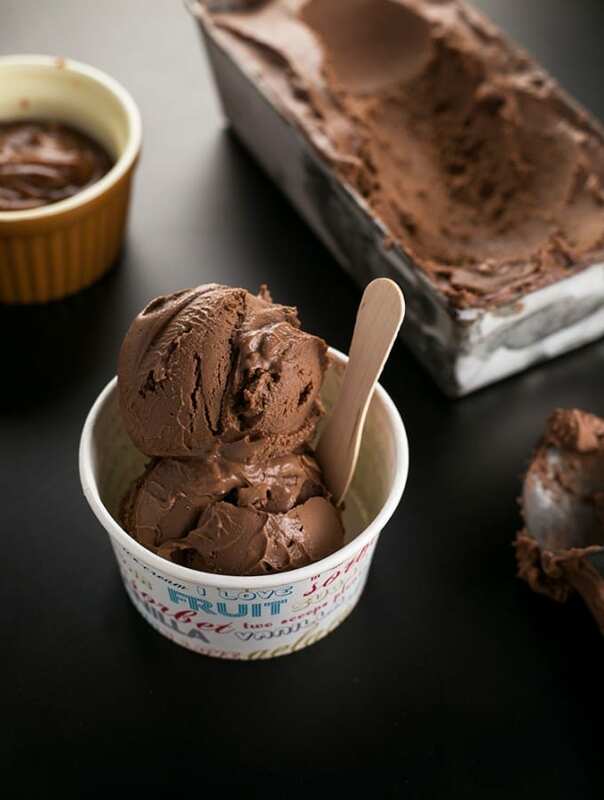 To prepare Chocolate Ganache, warm Non Dairy Cream in the microwave or in a saucepan. Pour hot cream over your 70% Chocolate, and then leave to sit for 1 minute. After a minute, stir to melt chocolate and until ganache is glossy. Add Sea Salt and Maple Syrup, stir well, and leave to cool. Prepare your Non-Dairy whipped cream according to instructions, adding Vanilla Extract and sweetening with Sugar if necessary. Set aside. If you are using Coconut Cream instead, whip up with Maple Syrup and Vanilla with an electric mixer till soft peaks form. To assemble, have dessert glasses ready. Cut a piece of your Chocolate Cake and place it at the bottom of your dessert vessel. Pour some of your Kirsch Soaking Syrup to moisten, and then add a layer of Cherry Filling followed by Whipped Cream. Repeat this process once more. 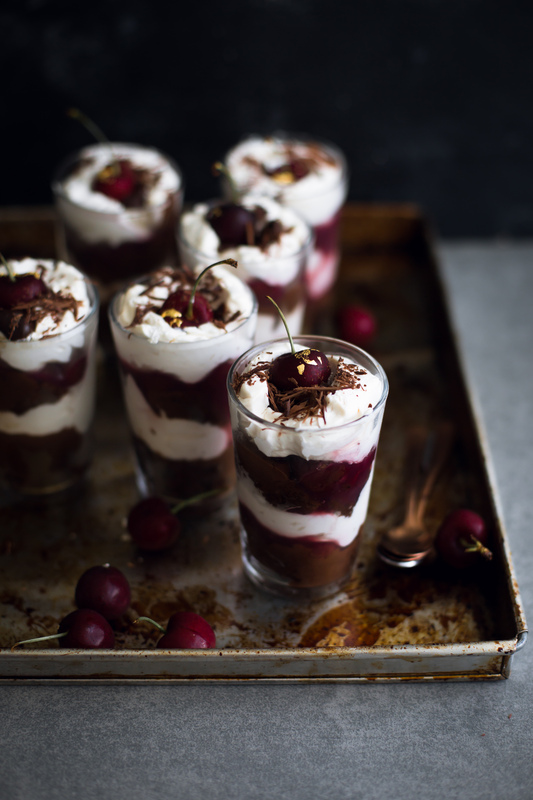 Top trifles off with Shaved Dark Chocolate and a fresh Cherry. Leave to set in the fridge for at least 4-6 hours before enjoying. * You will only use about 2/3 of the prepared cake, store extras in freezer for future use in Cake Balls/Rum Balls. Hi, thanks for sharing your recipe. 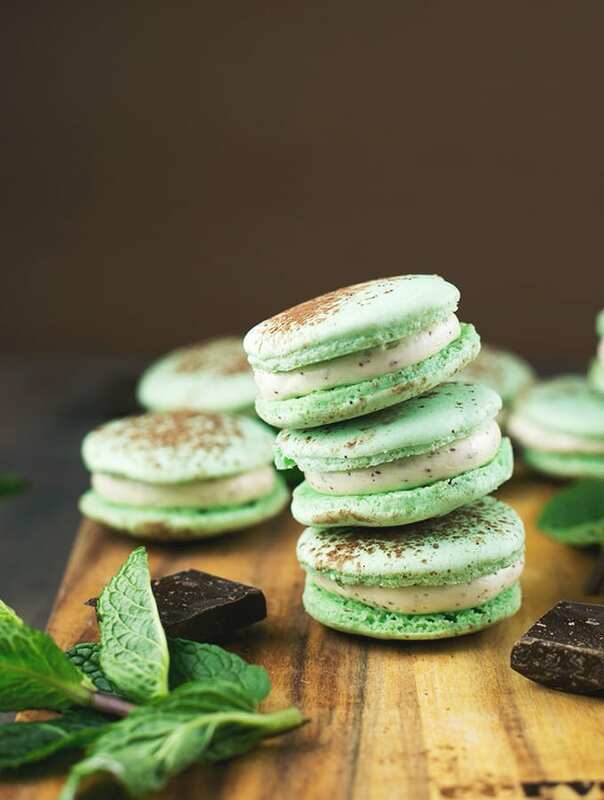 For the ganache, does non-dairy cream = coconut cream, or is there a particular brand/type that you use? Hey Lynette, I usually use Provamel, Alpro or SoyaToo. Look out for Single Soy Cream. You can use Coconut Milk in lieu. Hey Amrita! This dessert has caught the eye of my partner and daughter so it's gonna be our xmas day pud! (Pudding is what we call dessert where i come from!!) I am going to follow you on FB too cos you are the first vegan blogger who actually qualifies as local to me!! (I'm in Torquay) Will let you know how we go! Happy Solstice!